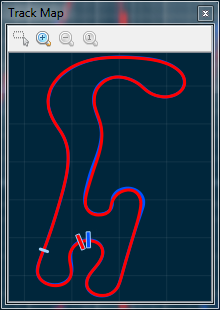 Version 21, with fixed track maps! Rather embarrassingly, yesterday’s release of track maps had a big flaw: The track maps were upside down and mirror-reversed. After a quick debate, we decided this was important enough to publish another release right away. So here it is, version 21! Cursors now have colors according to the lap they’re from, so it’s easier to see which cursor belongs where. Start-finish is now indicated with a little line. Faint grid-lines in the background. To get the new version, head over to the downloads page! Fortunately, the car picture with the number 21 wasn’t that great anyways.